Here's where it was. This entire Covington map is here. The race track opened on July 9, 1883.
wins a race at Latonia. 1913. 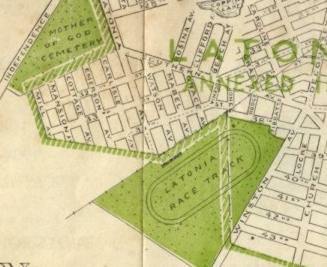 The Latonia Race Track was open from 1883 thru 1939. Judges were there because we're in the days before the “photo-finish” was implemented. Most horse tracks didn't have the equipment until the late 1940's, if then. Club House, original grandstand, and first turn, all c. 1910.